With unemployment the highest in six years, GDP growth struggling to remain positive, and ISM numbers repeatedly below 50, we continue to wonder why a recession has not been declared. Traditionally recessions are not declared until after the fact, in many cases even a year after the have begun. 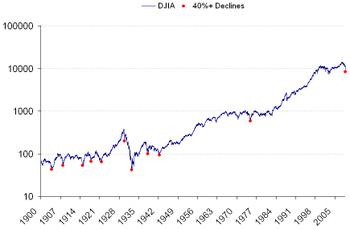 Below we highlight the recent significant recessions and stock market performance during them. 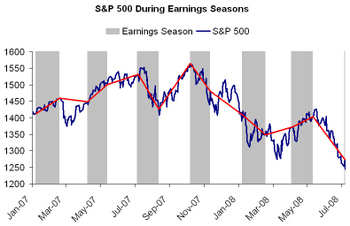 As shown, in each case the stock market bottoms over a month before the official end of the recession. 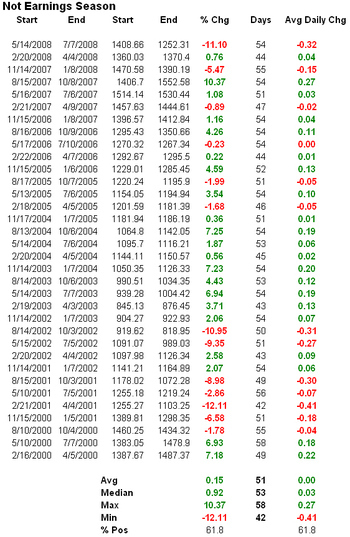 As shown by the "period" column under market bottoms, on average the S&P 500 bottoms about half way through the recession and rallies over 25% from the bottom to the official end. As of this morning's current levels (8270 on the DJIA), the DJIA is down over 40% from its peak on 10/9/07. 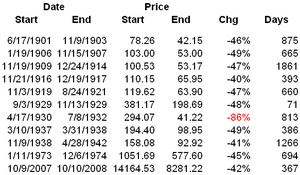 Below we have highlighted similar declines since in the Dow since 1900. The chart highlighting these significant declines could be comforting some and disconcerting to others. We cannot say when the bottom will occur, frequently they are when we least expect them, but in every occurrence save one the market rallied back to its pre-decline levels within the next year or two. The part that may be less comforting is that the market takes a long time before another rally ensues. Many commentators have compared this bear market to that of 1974. Until the most recent downturn they had been similar, but this decline so far has been just as bad in half the time. Judge for yourself which decline is most similar to this one. An important market indicator was recently released and showed a reading of a new all time high. Birinyi Associates tracks a plethora of technical, fundamental and sentiment based market indicators; recenty one of these was released showing an unprecidented number. Birinyi strategy bulletin #140 highlights this indicator and historical readings. Click here or call 800-357-4468 for more information. This morning before the open Birinyi Associates issued a research report on the energy sector and several reasons for today's rally. 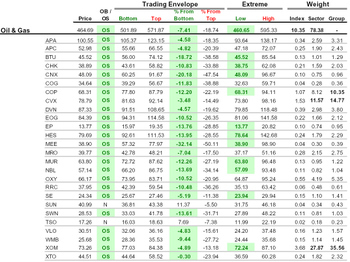 1) After yesterday's decline most energy stocks were the most oversold they have been in the last 18 months. Several of these stocks have reached such levels in the current decline, but a mass sell-off in a sector to extreme lows is usually a good indication of a bounce. 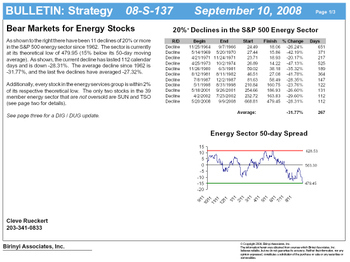 2) The average bear market for the energy sector is about -31%, the current decline was about -28%. 3) Using shares outstanding for the DIG (2x long energy ETF) and DUG (2x short energy ETF) funds we are able to identify buying in energy names. Below we will break down each of the points listed above. First, the energy sector as a whole traded down to a new theoretical low (more oversold than any other period in previous 18 months). 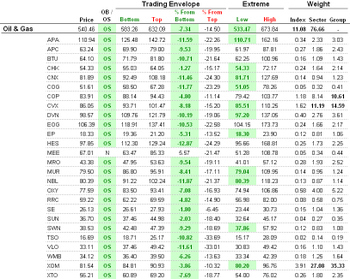 This is the first indication that a stock or group is outside of its normal trading parameters. Secondly, this bear market in energy has taken the sector down nearly as much as the historical average for these stocks. Additionally, this does not appear to be a short-term trend. 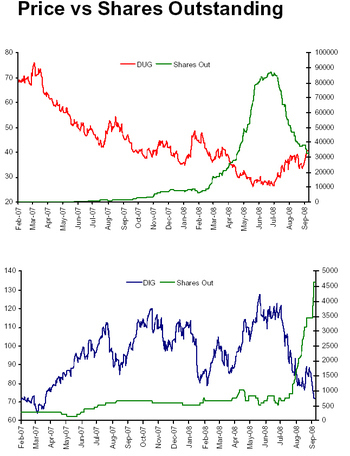 Prior to the decline in energy we saw a large increase in shares outstanding for the DUG fund that coincided with increasing volume. Now we are beginning to see that trend reversing. 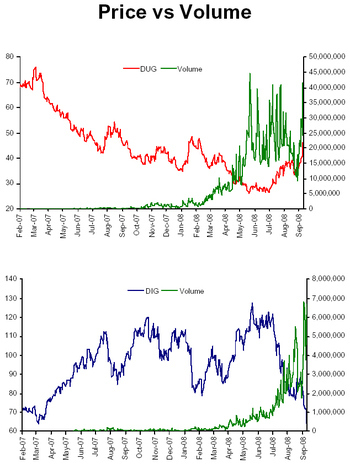 Holders of DUG are selling shares back to the issuer, and we are seeing an increase in the shares outstanding for DIG which coincides with increasing volume. (We attribute the difference in scale for shares to two things: Difference in price DIG: $65 vs DUG $40, and long only accounts using DUG as a hedge where DIG might be less useful as they can just buy stock.) 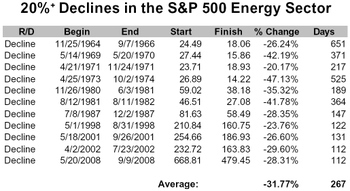 Based on the table highlighting historic bear markets for energy it is possible that the decline may continue (the worst was -47%), but at this point there is a good case for consolidation and a trading opportunity as the sector returns to its normal range. Click here to learn more about products and services offered by Birinyi. Mini-institutional subscribers received the featured report in their inbox before the market opened this morning. Yesterday's weakness offered at least some hope for a bear market bounce. Total volume traded for S&P 500 names topped 6bln shares, couple that with a 3.4% decline and we would expect that much of the weak money has left the market. 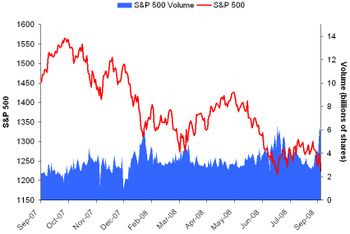 Granted there were outside issues at work here (thank you Lehman Brothers), but as shown below these volume spikes have coincided with short-term bottoms. The only issue which remains open is the VIX index which closed at just over 25 yesterday. 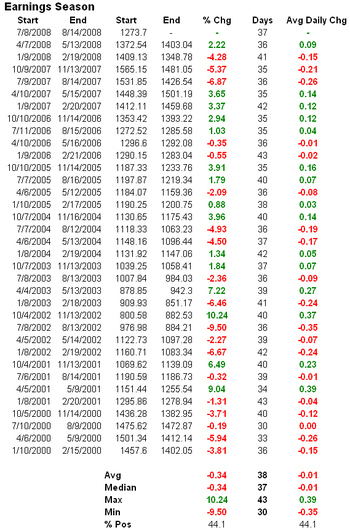 It had a large move on the day, but at the market's lows in January, March and July it reached intra-day levels of 30+. There has been much talk recently of firms unwinding their long commodity and short financial strategies. The energy sector experienced a quick 20% decline and financial stocks began to look attractive, for a minute. 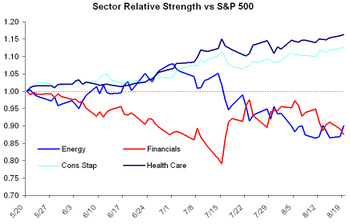 Below we look at selected sectors' relative strength versus the S&P 500. 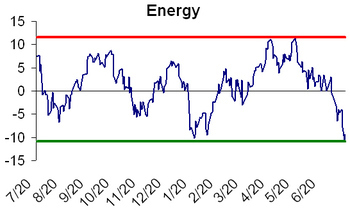 The chart begins on May 20th, energy's peak. 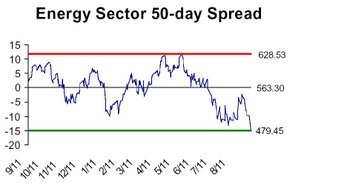 As the energy sector declined financials firmed, this was a short-term phenomenon. As the last week has shown, the bad news has not ended in the financial sector and the energy correction is drawing to a close. The defensive stocks have been the best names, with health care leading and consumer staples closely following. Energy however is likely to offer the best opportunity in the coming months. Oil has found short-term support at $111.75 and the 200-day moving average ($110.37 currently), with strong support at $100. As oil slows its decent look for energy stocks to regain some of their losses. 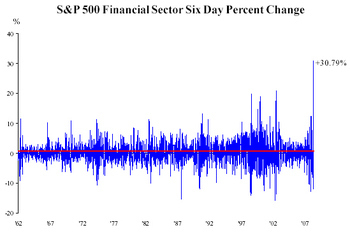 Between 7/15 and 7/23 the S&P 500 financial sector rallied 30% over 8 days and marking the beginning of a new bull market after its 54% decline from 2/20/07 to 7/15/08. Birinyi Associates defines bull and bear markets based on the traditional definition of a 20% gain or loss from peak to trough. 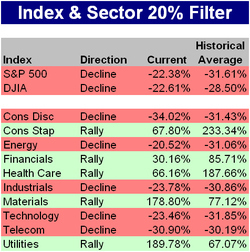 The following table highlights the current cycle for the DJIA, S&P 500 and its ten sectors as well as the historical average (since 1962) for each. The sectors are traditionally more volatile than the markets; financials for example have had 20 bull and bear market cycles since 1962 compared to the S&P's eight rallies and nine declines. Please note that the utilities and materials sectors peaked on 12/10/07 and 5/16/08 but have not yet declined 20% from those peaks and have therefore not yet entered a new cycle. The average bear market for utilities is -32.26% and the average bear market for materials is -29.02%.